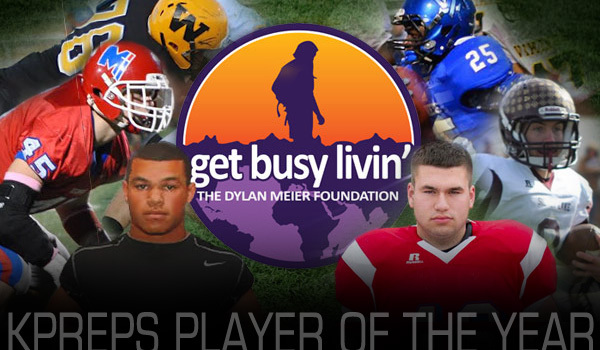 Kpreps.com is proud to announce another strong group of finalists for the third annual Get Busy Livin’ – Kpreps Player of the Year Award in conjunction with the Dylan Meier Foundation. The 2013 award finalists include Shawnee Mission West offensive lineman Austin Chambers, Derby linebacker Jose Delgado, Bishop Miege linebacker Brad Ivey, Silver Lake quarterback Dailin Kruger, Hiawatha defensive lineman Peyton Newell and Leavenworth running back Jason Randall. The award is in honor of Dylan Meier, a former All-State quarterback at Pittsburg High School and starter at Kansas State University who died in a hiking accident in 2010 at the age of 26. The annual award goes out to one Kansas high school senior who not only has shown excellence on the field but also has demonstrated the values that Dylan embodied and Get Busy Livin’ (GBL) strives to promote: adventure, fitness, curiosity and a daily zest for life experiences. Past award winners include Brad Strauss of Lawrence in 2012 and Kole Schankie of Madison in 2011. Players from around the state were nominated. The GBL committee then narrowed the list of candidates to six. A Bringham Young University commit, Chambers was a team captain for the Vikings as a junior and senior. He is a two-time All-State honoree and a two-time all-conference honoree. Chambers helped Shawnee Mission West to a 12-1 record and a Class 6A state championship in 2012. He was the recipient of the Marcus Priddy Award and has been a three-year starter for the Vikings’ basketball team. Chambers will be delaying his college career at BYU for two years to fulfill his mission trip. He has been involved in several off the field activities. He was an Eagle Scout, a two-time student body officer, a student council officer, a three-year madrigals performer, a four-year member of the choir and a two-year member of the orchestra. He was a church youth group leader and a member of the regional youth committee member. He volunteered for Just Say No, City of Lenexa Clean-up, Harvesters, a talent show for the elderly, the City Union Mission, Little Viking football and basketball and Operation Breakthrough. The Butler Community College recruit received Top 11 honors from the state’s media and coaches. He also earned All-State, all-metro and all-conference accolades. He was Class 6A’s Defensive Player of the Year and the powerlifter of the year. Delgado helped the Panthers to a 6A state championship in 2013. He was the top vote getter as team captain. Off the field, Delgado has been involved in student council, peer reading, Special Olympics, Operation Holiday and his youth group. The Southeast Missouri State commit started all four years for the Stags. Ivey earned Top 11 honors from The Topeka Capital-Journal and The Wichita Eagle his senior season and was a three-time All-State and all-league performer. He was the Eastern Kansas League’s Defensive Player of the Year in 2013. Ivey recorded more than 120 tackles in each of the past three seasons to finish as the school’s all-time leading tackler. He has been an active member of the Campus Ministry Team. He also has been a coach at youth football camps and has been active in his parish and the Organized Team service project. The three-year starting quarterback led the Eagles to a Class 3A state championship in 2013. Kruger was a Top 11, All-State and all-league performer as a senior. He also has been an All-State outfielder for Silver Lake’s baseball team. Kruger’s senior season was all the more impressive when you understand that he played most of the year with a torn ACL in his knee. He originally injured his knee in the second game of the season but continued to play. In the fourth game of the year, Kruger re-injured the knee and was told that he tore his ACL and would need surgery. Kruger urged the doctor to custom-fit a brace so he could play the rest of the season. He returned for the sixth game of the season and went on to lead the Eagles to the state title. Off the field, Kruger has been an active member of his church and its youth group. He helps with Sunday school, babysits for church families on Sunday evenings, helps with fundraisers for community members with cancer and assisted the youth football team. He’s been an officer in the FFA, a Powder Puff coach, he went on a mission trip to Nicaragua this past summer. The University of Nebraska recruit earned Top 11, All-State and all-league honors. Newell broke school records for career tackles (257), career tackles for loss (105), career sacks (33), tackles for loss in a season (37), sacks in a season (12) and sacks in a game (4). Newell honors his mother’s passing by being a promoter and chief fundraiser for the Missy Newell Memorial Fund. The organization raises funds for breast cancer research and post-operative living for breast cancer survivors. He also is a volunteer for food collection and distribution in the area, and he helps with the local historical society. Randall has been an All-State and all-league performer for Leavenworth, rushing for 1,370 yards his senior season. He also was a team captain and earned the Mr. Football Award. He’s also participated in basketball, baseball and track and field. He was a state medalist in powerlifting. He has served as a coach for the Special Olympics, as well as for youth football. Randall has volunteered his time doing yardwork and household chores for spouses of deployed soldiers. He also took part in the team’s Hire A Player fundraiser, doing yard work and shoveling snow for elderly people in the community. He helped with an Easter Egg Hunt for soldiers and their families at Fort Leavenworth. Photo credits: Austin Chambers #76 (PrepsKC), Jason Randall #25 (PrepsKC), Brad Ivey #45 (Matt Gilmore), Dailin Kruger #9 (Matt Gilmore), Jose Delgado (Everett Royer), Peyton Newell #40 (Carla Wehmeyer).